Fresh mozzarella. Tomato. Basil. Such a classic and delicious combination. 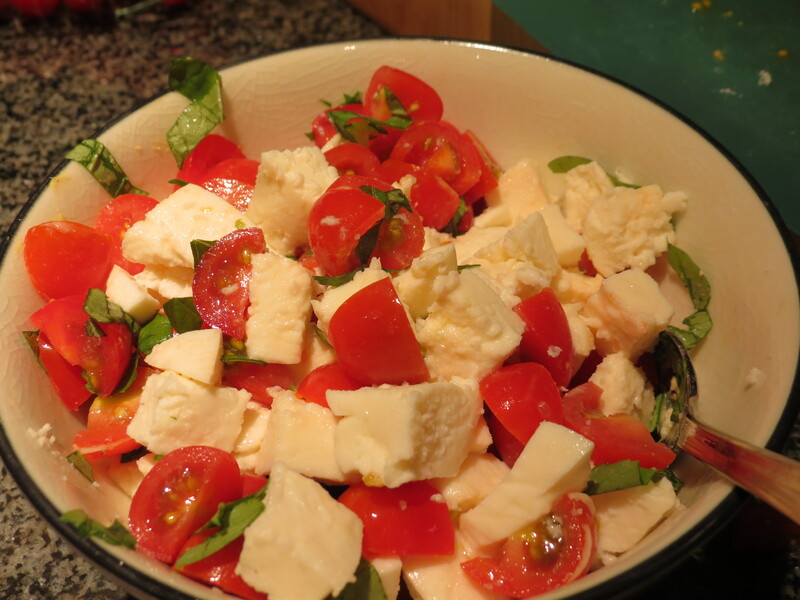 Usually when I have these ingredients I’ll make a classic caprese salad with a nice balsamic dressing. But we had that for dinner last night, so tonight I needed to be a little creative while the mozzarella was still fresh. So tonight, I decided to take the classic a step further and turn it into a main course by adding some balsamic chicken to the mix. This is a super easy and quick weeknight meal that only takes about 15 minutes start to finish. This served 2 people with extra bruschetta topping which I added to a salad. If you needed 4 servings, the only thing you’d need to increase was the number of chicken breasts. The preparation is super easy. 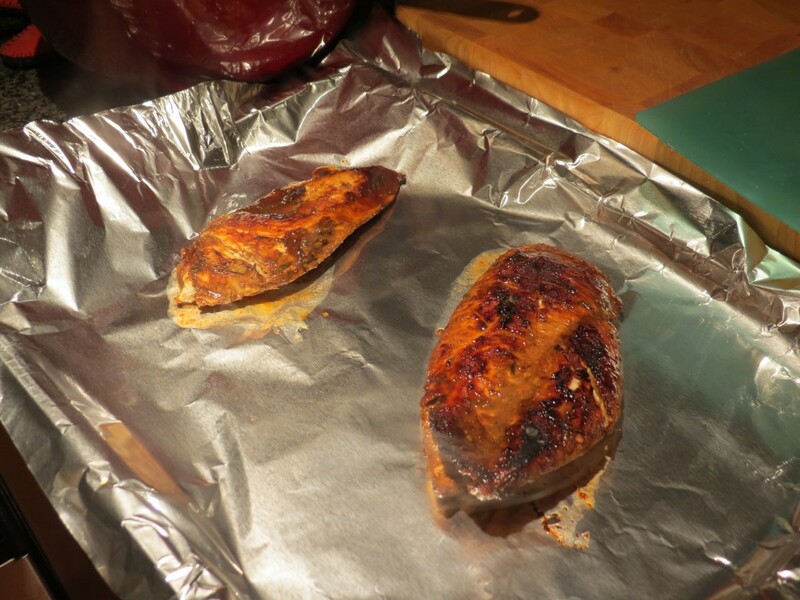 First you want to mix a balsamic marinade for the chicken. 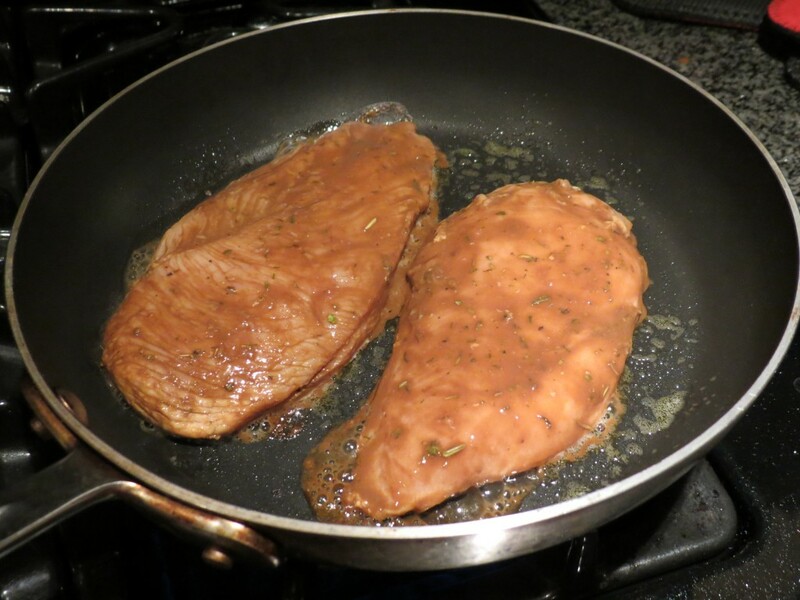 The trick to a nice thick marinade is either a lot of olive oil or a lot of mustard. Since I am a life long weight watcher, I opt for the mustard, but still added some olive oil to add some richness. 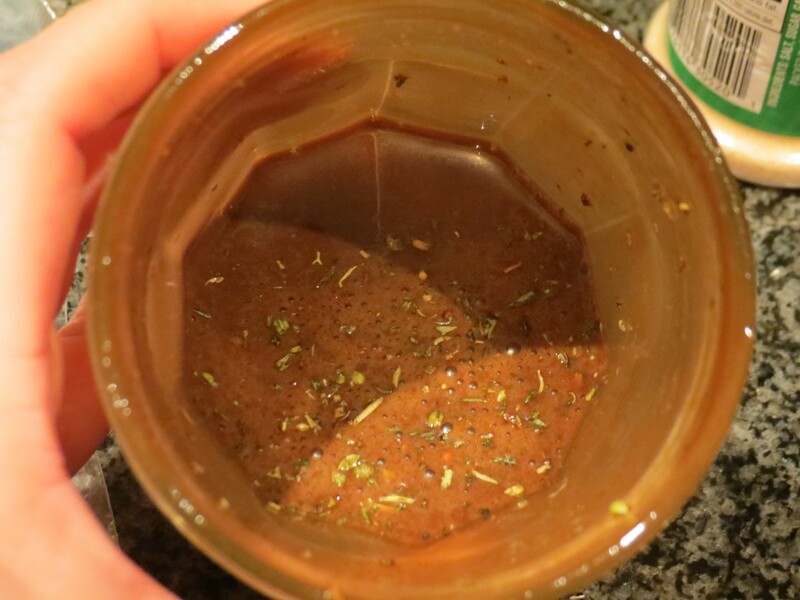 In a jar (or however you mix your salad dressing or marinades) combine mustard, balsamic, olive oil, garlic salt and bouquet garni. 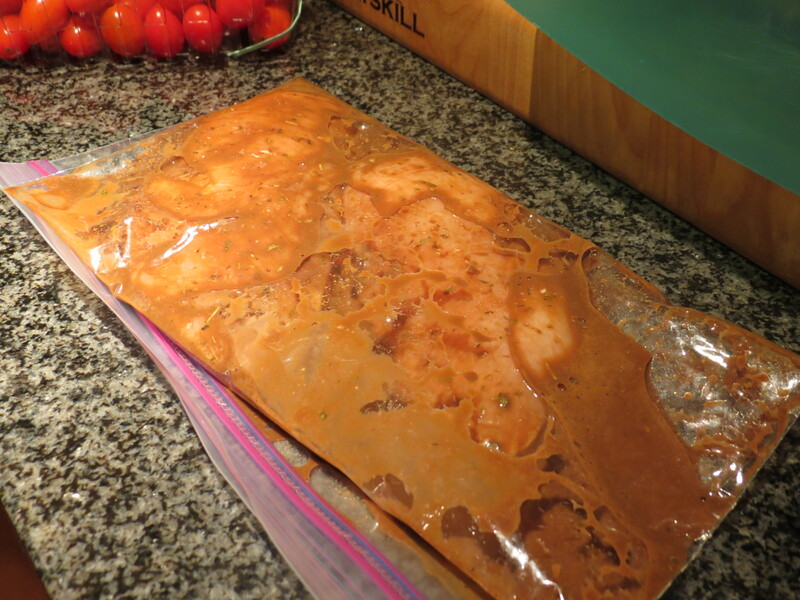 Add chicken and marinade in a gallon bag, seal and shake well until chicken is fully coated. This is one of my favorite ways to marinade chicken because the clean up is super easy. Let this rest for a few minutes while you prepare the bruschetta topping. 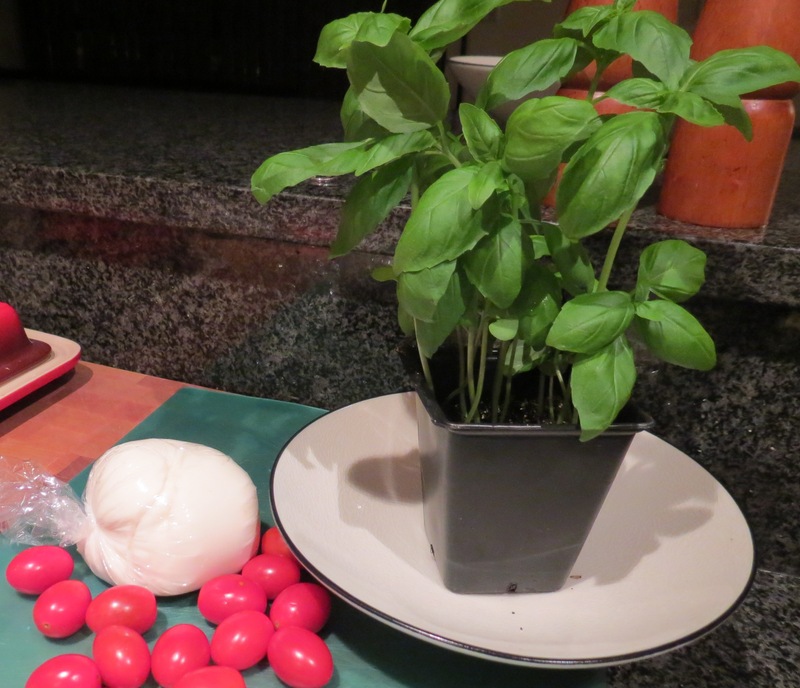 To prepare the bruschetta cube fresh mozzarella, slice cherry tomatoes into quarters and finely chop the basil. Mix gently to combine. So simple and so beautiful. 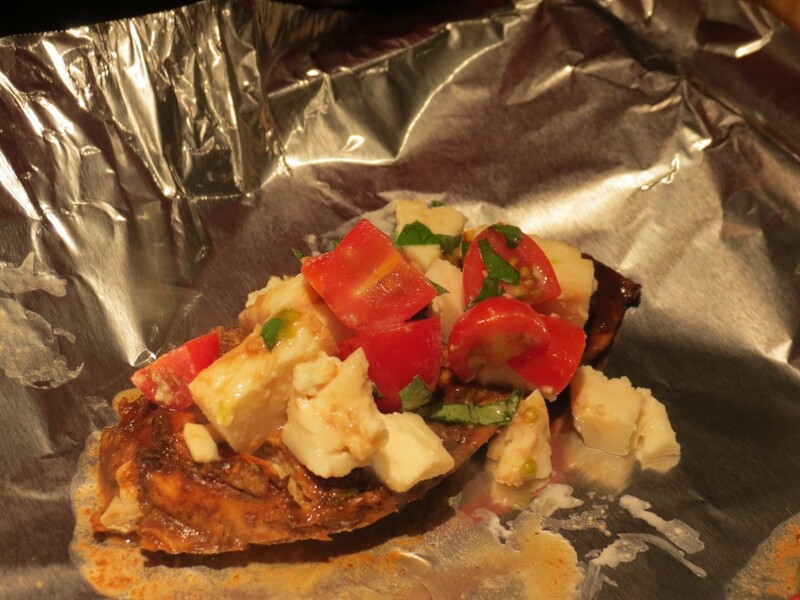 If you have larger tomatoes, you can thinly slice both the mozzarella and the tomatoes and layer them onto the chicken. Cook the chicken covered over medium heat until cooked through. My chicken cooked in 9 minutes (4.5 on each side). Now, the balsamic will make your pan look like things are burning and not going well, but that’s just the sugars caramelizing. As long as you cover your chicken and cook it over medium heat it will stay really moist, I promise! 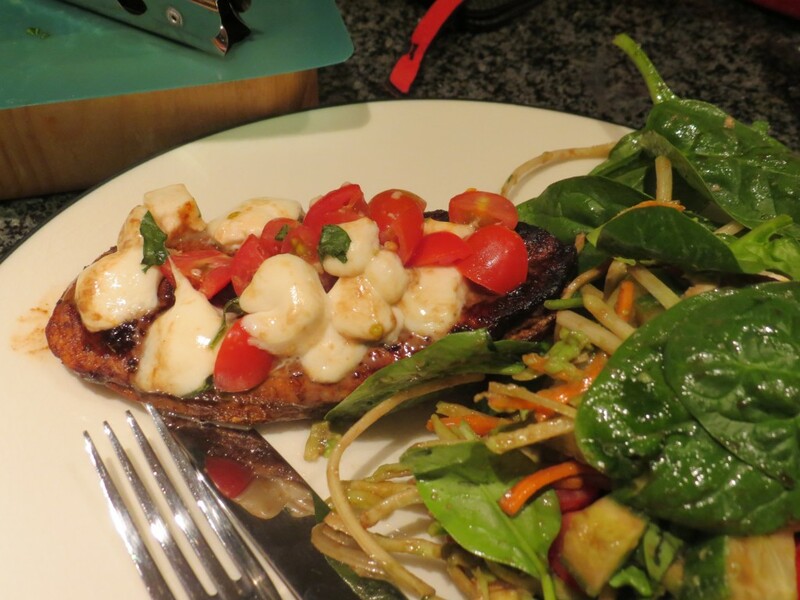 Once the chicken is cooked through, you have 2 options: you could either add the bruschetta as a cold topping and let the heat of the chicken slightly melt the mozzarella cheese. This would be nice on a warm summer day. Since it’s a bit colder, I went with option 2 which is to top the chicken with the bruschetta and stick it under the broiler for for about 90 seconds to let the cheese melt without overcooking the chicken. 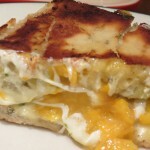 I served this with a salad, but you could also serve it as a sandwich or with some steamed veggies. 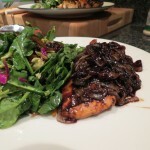 Either way it’s a beautiful and super versatile meal that’s perfect for a weeknight dinner.